Common at low and moderate elevations in clearcuts, burns, grasslands, weedy woodland edges, and agricultural habitats on both sides of Cascades. Clearing of forests has increased habitat in western counties, as has conversion of lands to agricultural uses in Kittitas County. Fairly scarce in shrub-steppe, and not recorded from much of predicted range in eastern Kittitas County mapped by Washington Gap report (Smith et al. 1997). 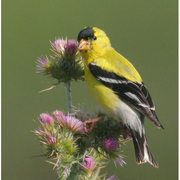 Thistles favored food source in disturbed habitats. The few high-elevation records may represent upslope wanderers. Washington subspecies are C.t. pallidus east of Cascade crest, C.t. jewetti to west.